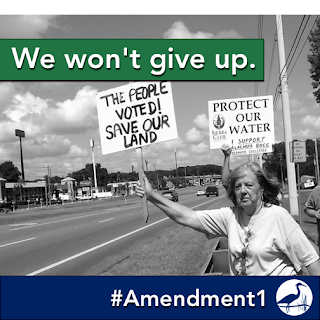 (August 28, 2015 -Tallahassee) The Sierra Club, the Florida Wildlife Federation, St. Johns Riverkeeper and the Environmental Confederation of Southwest Florida represented by Earthjustice filed suit today asking the courts to force the Florida Legislature to return Amendment 1 funds to a conservation land buying fund. "We are asking for Florida’s courts to uphold the constitution as amended by the voters,” said Sierra Club Florida Conservation Chair Tom Larson. “The legislature needs to be held accountable for ignoring the will of the people." The funds from documentary stamps on land transactions, which are expected to reach $740 million next year, were diverted by the Legislature to accounts that had nothing to do with land acquisition. Among other things, they were used to pay state executive salaries, agricultural pollution subsidies and insurance premiums. Funds the Land Acquisition Trust Fund to acquire, restore, improve, and manage conservation lands including wetlands and forests; fish and wildlife habitat; land protecting water resources and drinking water sources, including the Everglades, and the water quality of rivers, lakes and streams; beaches and shores; outdoor recreational lands; working farms and ranches; and historic or geologic sites, by dedicating 33 percent of net revenues from the existing excise tax on documents for 20 years. 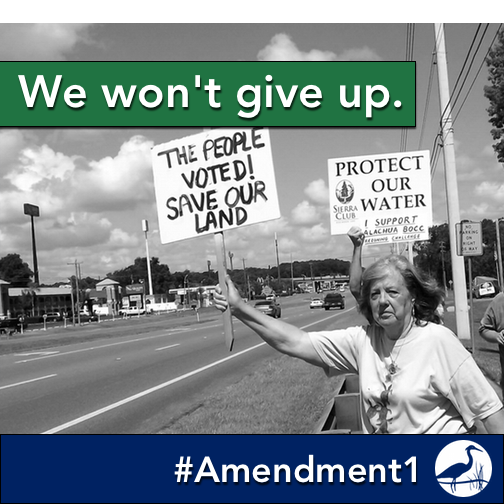 An extraordinary 75 percent of the electorate voted for Amendment 1 proving that the people of the state understand the need to protect the richness of Florida's wild heritage and unique waters. Florida environmental advocates are asking state Attorney General Pam Bondi to drop her lawsuit against a federal plan to clean up greenhouse gasses; in a press conference at Tampa City Hall Tuesday morning the Florida staff director of the Sierra Club said his group is not a fan of Governor Rick Scott’s administration. But Frank Jackalone praised Scott’s response to the Obama administration’s Clean Power Plan. The EPA’s Clean Power Plan calls for carbon pollution in the U.S. to be reduced by an average of 28% and for each state to be in charge of its own reductions. Florida needs a plan by next year to reduce emissions by 25%. Jackalone says low-lying coastal cities like St. Petersburg and Tampa are particularly vulnerable if nothing is done to reduce carbon pollution. Sean Shaw used to work in the state CFO’s office as insurance consumer advocate. He warns that if greenhouse gas pollution isn’t brought under control the economic consequences in Florida will be severe. Ken Conklin said he supports the Clean Power Plan because fewer air pollutants will help his environmentally-induced asthma. Conklin owns a small consulting business called Neighborhood Nerd and he says even people who aren’t sick would save money by investing in cleaning up the environment. He cited his medical bills that are often picked up by federal programs like Medicaid. Also at the press conference was the executive director of Florida Council of Churches who spoke about the morals of battling climate change. Meanwhile, Tuesday the Obama administration proposed cutting methane emissions from U.S. oil and gas production by nearly half over the next decade. It’s part of on ongoing push by President Barack Obama to curb climate change. The Sierra Club’s Frank Jackalone says reducing natural gas emissions is an important step to control global warming. The Obama’s administration’s target is to cut methane from oil and gas drilling by 40 to 45 percent by 2025, compared to 2012 levels. A new rule would require energy producers to find and repair leaks at oil and gas wells and capture gas that escapes from wells that use a common drilling technique known as hydraulic fracturing, or fracking. Officials estimate the rule would cost industry from $320 million to $420 million in 2025. But reduced health care costs and other benefits would total about $460 million to $550 million. TAMPA, Fla. -- Today, the EPA and the Obama Administration released the final version of the landmark Clean Power Plan. “Floridians stand to benefit immensely from the Clean Power Plan. Florida’s air will be healthier with less dirty emissions, and our economy stronger thanks to the addition of tens of thousands of jobs installing solar panels and energy savings retrofits to our homes and businesses.